It’s that time of year again, the football season is drawing to a close and that means it’s time to start thinking about rewarding your players for their excellent efforts. What better way to do this than to give them their very own keepsake in the form of a shiny trophy? Here at Pendle Sports we have a great range of football trophies to choose from, starting at only £1.79! Whether it’s an award for the whole team or one for the individual, we have a trophy to suit. Most of our trophies come in a range of sizes, usually a choice of three, and even our smallest still looks great taking pride of place in the centre of any shelf. Of course we know that everyone likes a little recognition now and then, so to add a more personal touch to the individual rewards we offer an excellent variety of trophy styles. These include footballs, boots and footballers both male and female in imaginative settings and postures. 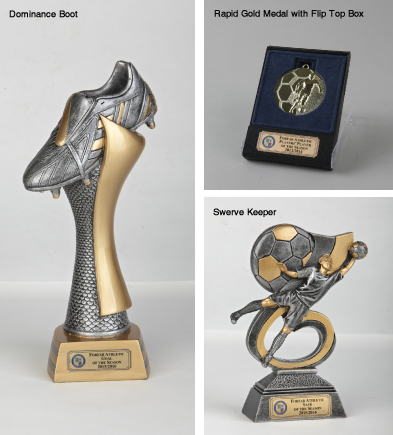 For your goal keepers, we have some specific trophies to acknowledge their excellent efforts too. The ‘Swerve Keeper‘ is new to our range featuring a goalkeeper in action, in a gold and silver finish. For the top goal scorer in the team the ‘Dominance Boot‘ trophy would make a fitting award, and for the most triumphant defender we would recommend the ‘Rival Player‘ trophy. Having your efforts recognised by your team mates feels like a great achievement, so why not let them vote for their favourite player of the season too. Our ‘Conquest Player‘ or ‘Victory Star‘ trophy would be perfect for this honour! We also have some more traditional shields, cups and luxury cups which are great for rewarding the whole team for their dedication and success at the end of season presentation. Not only do we supply top quality Football Trophies, here at Pendle we also offer FREE customised colour printing. All of our trophies come with a high quality brushed gold effect PVC label which allows us to reproduce full colour club badges, beautifully sharp with vivid colours. If you would like to see how your clubs badge would look, you can send for a sample free of charge! If you only have a small budget this year or even a team of much younger players we also have a great range of football medals starting form as little as 99p, including ribbon. For our medals we offer a range of coloured ribbons both striped and plain, presentation boxes and also our FREE colour printing for your clubs badge. This way you can be sure to reward the whole team. Don’t forget we offer FREE UK postage on all orders over £100.